One of my favourite day or weekend trips out of Melbourne is the Mornington Peninsula. It’s a diverse region, full of pristine beaches, great surf and a burgeoning food scene, brimming with top quality restaurants and picturesque wineries. And just over an hour from the city, it makes the perfect weekend escape. 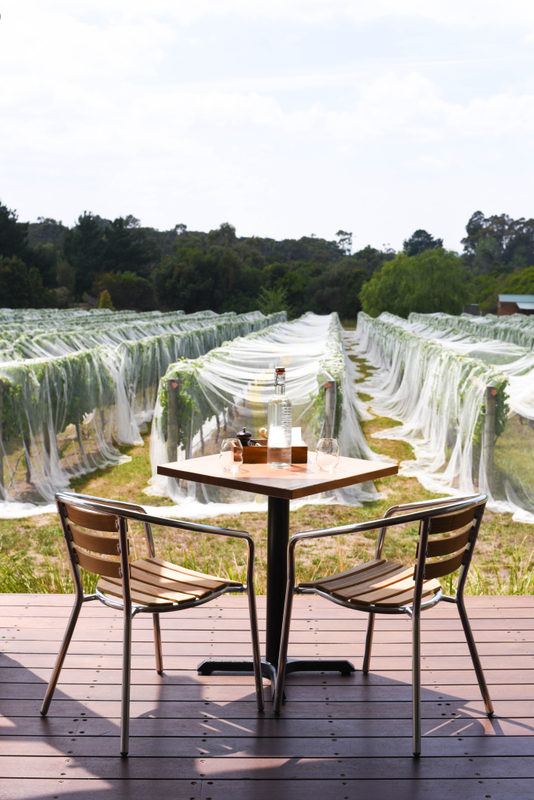 Red Hill is my usual go to place when it comes to wineries and restaurants, but there’s still plenty of other places on the Mornington Peninsula to explore. 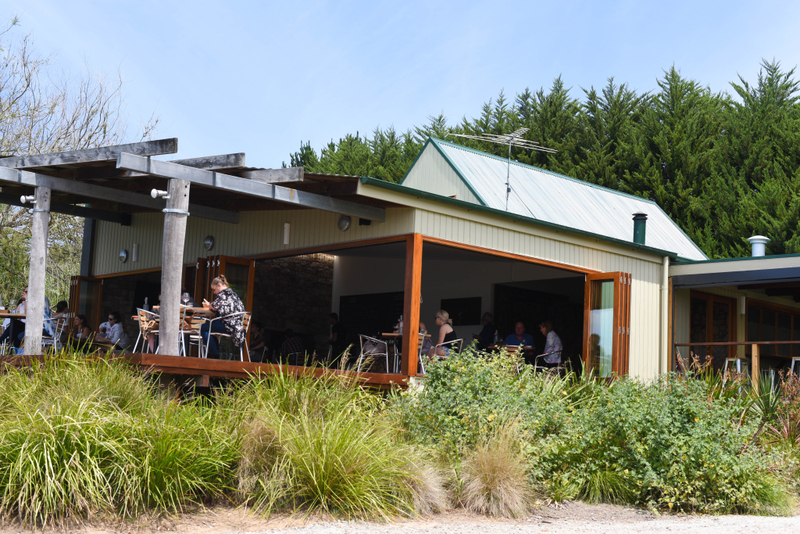 One of the latest cellar doors to open this year is Merricks Creek Winery in Merricks. 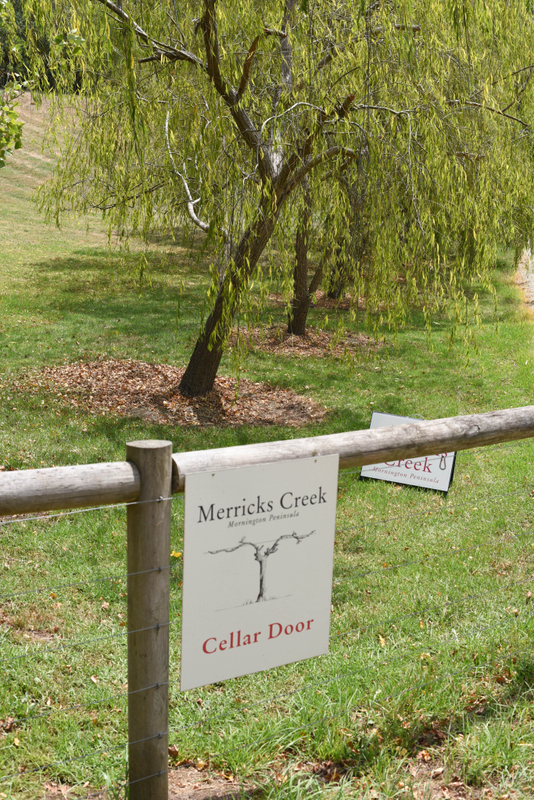 Merricks Creek Winery is in a gorgeous secluded spot, nestled in the vines on a small lane off Merricks Road. 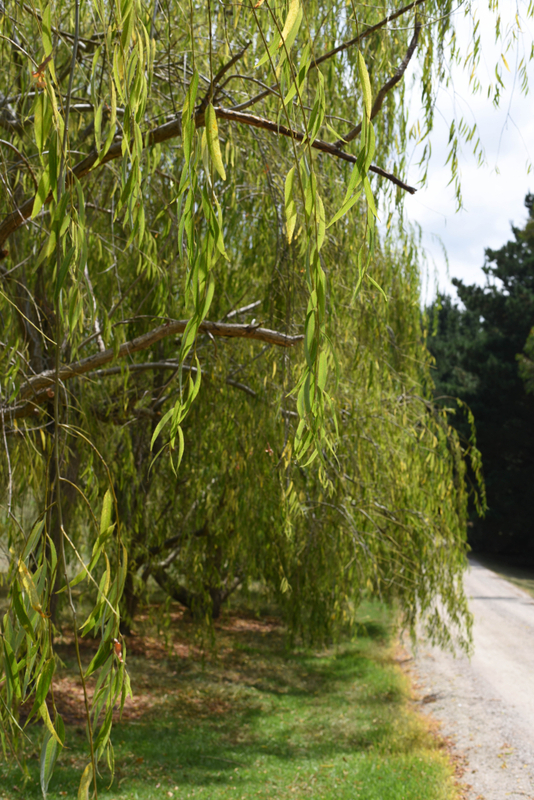 After following the winding path through the trees and wild flowers, we discovered the winery and cellar door which is in the heart of the action, only a small stone’s throw from the vines. 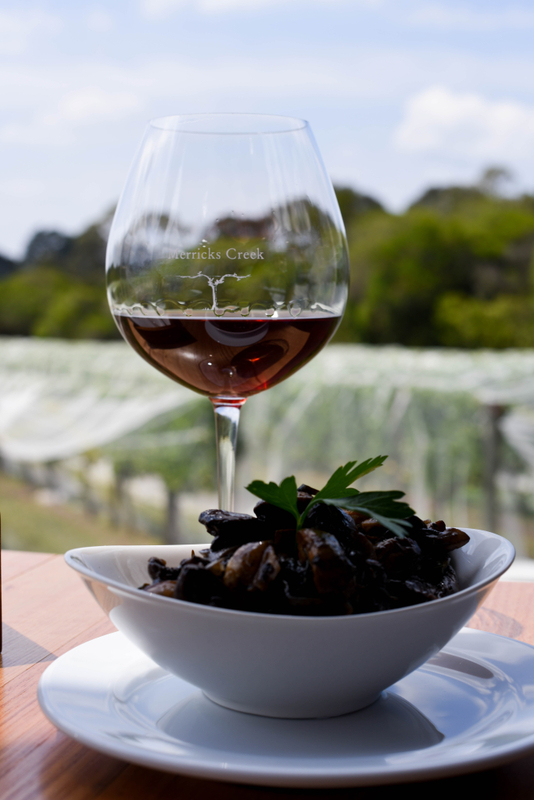 Merricks Creek Winery is a family run business which has been making high quality wine for nearly two decades. What started as a grape growing business has transformed into a winemaking business in 2001 and now, in 2016, it has its very own cellar door which just opened in January. At Merricks Creek Winery, it’s all about family. Peter Parker is the wine maker, while his wife Georgina works in the kitchen and their children Sam and Georgia-May are heavily involved too. Their son, Sam, had a dream to open a cellar door and it’s beautiful to see Peter and Georgina supporting that passion. Peter has had a long term love for pinot noir and modestly describes the winery and cellar door as a “hobby gone mad”. We are immediately made to feel welcome and have a chat with Peter who guides us through the pinot noirs. What I love the most about their approach here is the lack of pretension and puffery, and it’s obvious they love what they do. The cellar door has an understated warmth and homely feel, with a rustic stone feature wall and wooden fittings. There’s a large alfresco deck perfect for soaking in some sunshine in the summer months, while in winter you can retreat indoors to the cosy wood fire. 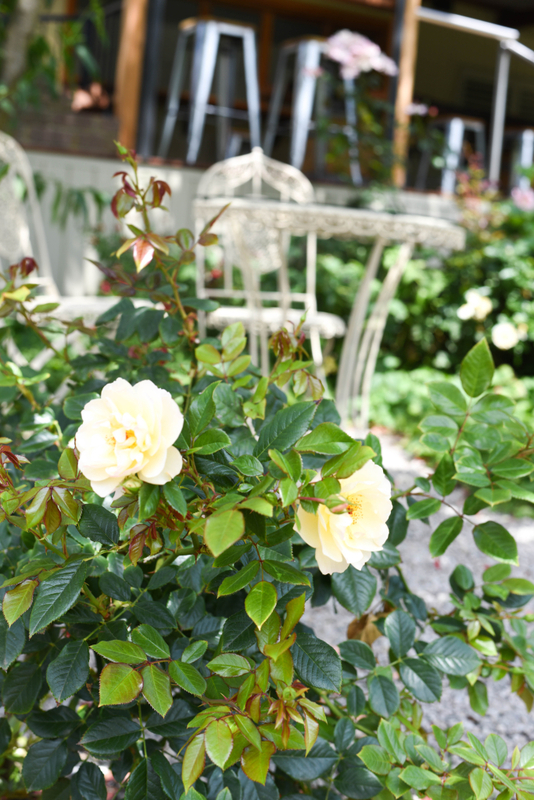 The alfresco deck is the perfect place to kick back and relax for the afternoon and enjoy a bottle of pinot accompanied by some of their shared plates. You’ll feel like a world away from the bustle of the city in no time. The secluded location is quiet and tranquil with enchanting views over the vines. 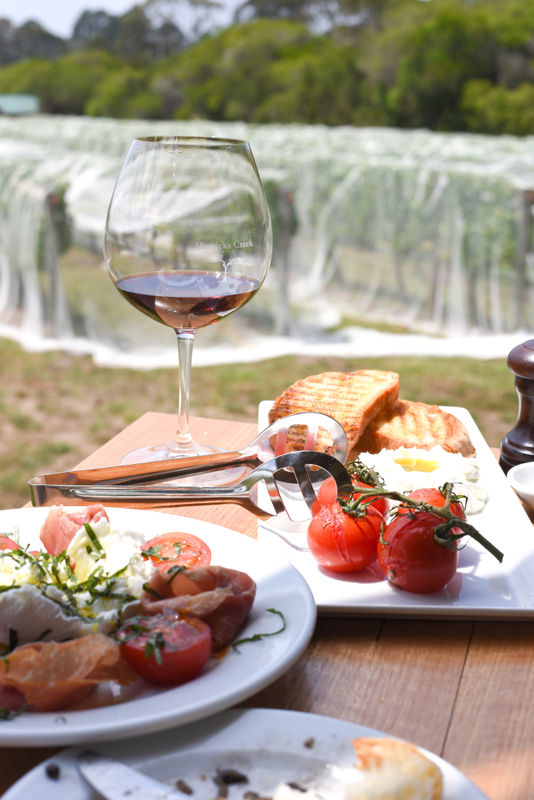 With a focus on shared plates, the winery is the perfect spot for a casual lunch with friends. 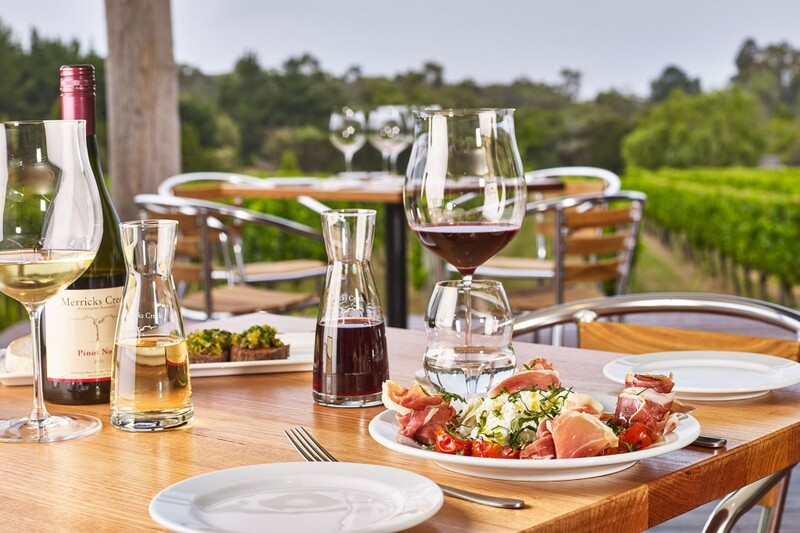 Besides Foxey’s Hangout in Red Hill, the casual lunch options at a winery are fairly slim on the Mornington Peninsula. Elegantly scrawled on the cellar door’s blackboard, the food menu focuses on small plates designed to share. The food is all about rustic simplicity and seasonally changing shared plates, which add pleasure to their pinot noirs and chardonnay. There’s roasted tomatoes, Main Ridge Dairy goat curd and grilled ciabatta and crispy thins packed with pistachio, hazelnut, feta, mozzarella and mint. 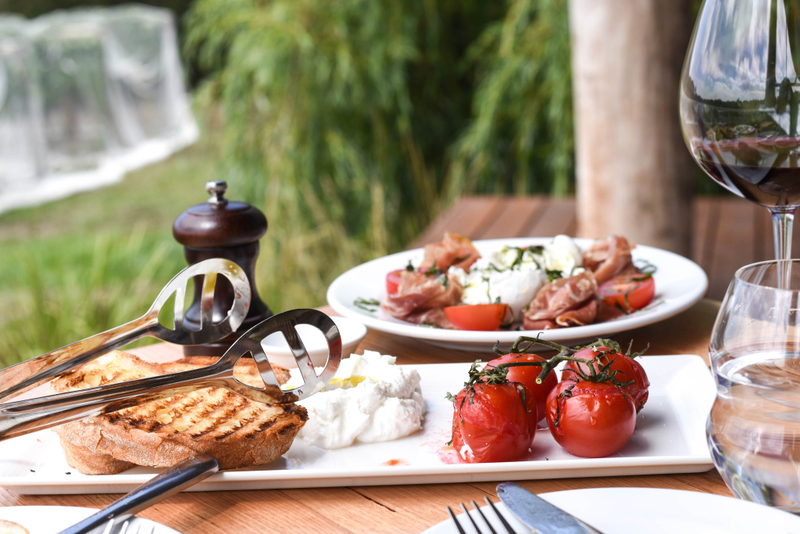 For something a little ‘meatier’ the $15 plates are more substantial with options like a rare eye fillet, caper vinaigrette and ciabatta or a twenty month aged Italian proscuitto di Parma, Shaw River buffalo mozzarella, tomatoes and basil. On the wine list, five pinot noirs (2011 – 2013) are showcased with one chardonnay (2015). The wine starts at $10 a glass, which is great value given its quality. While retaining its light delicate flavours, the pinot noir has lovely intensity from the winery’s close planting method. We started with the tarragon mushrooms with ciabatta. The tarragon gave the mushrooms a subtle anise flavour and gorgeous aroma which really lifted the earthiness of the mushrooms. Another winning dish is the vine roasted tomatoes paired with Main Ride Dairy goat curd and grilled ciabatta. Perfecly roasted, the tomatoes literally popped after every mouthful and were the perfect accomplice to the super creamy goats curd. 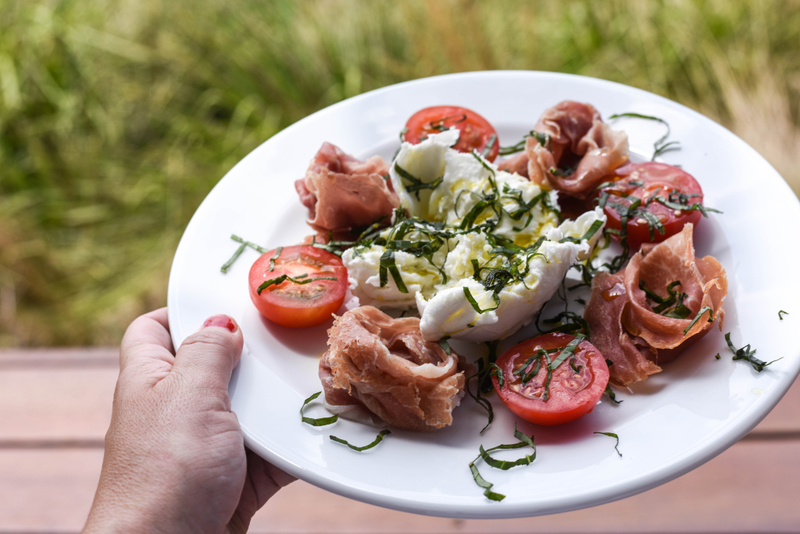 My personal favourite shared plate was the twenty month aged Italian proscuitto di Parma, Shaw River buffalo mozzarella, tomatoes and basil, served in a rustic manner on a shared plate. Sometimes in life it’s the simple things that are the best and the combination of prosciutto, mozzarella, tomatoes and basil is a real winner. Equally tempting is their dessert sharing plates. There’s a deconstructed tiramisu and a pair of sumptuous passionfruit and white chocolate pots. 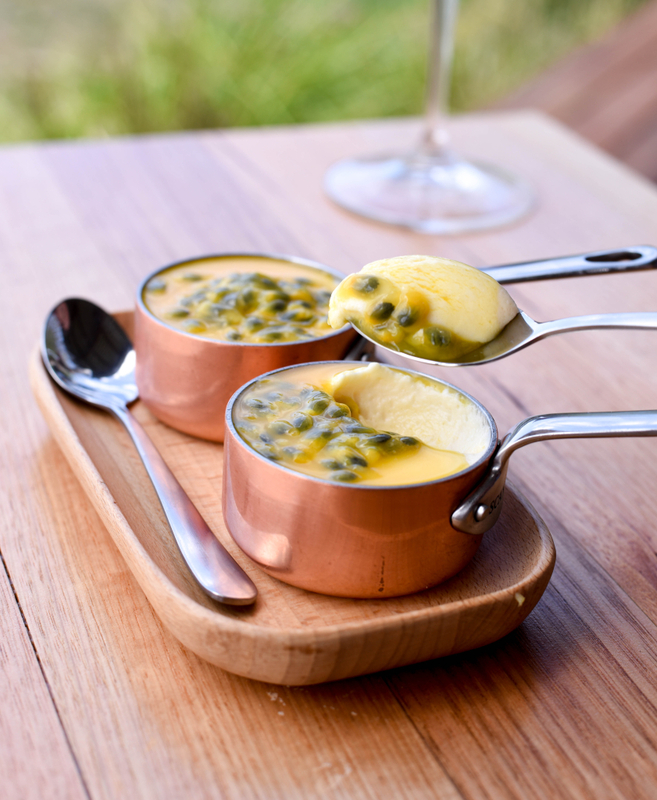 Served in tiny copper Scanpans the passionfruit pots were just delicious, with a white velvety layer of white chocolate mousse finished with a zesty passionfruit coulis. 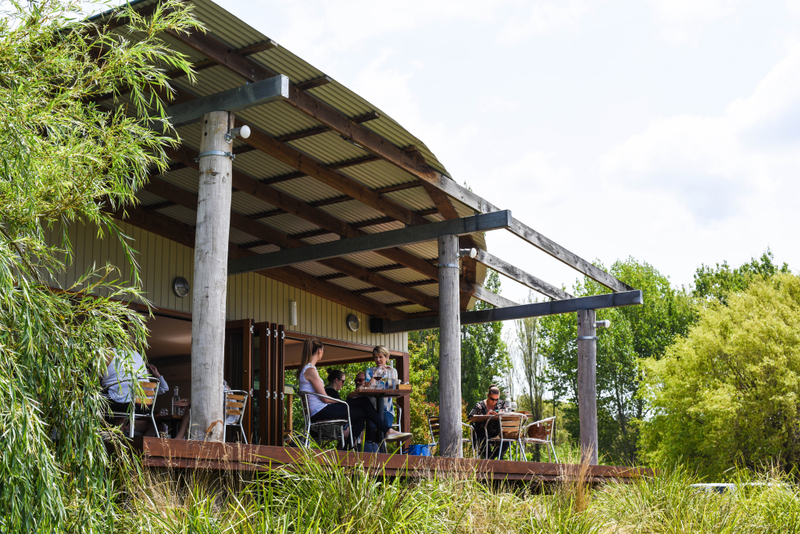 Merricks Creek Winery is definitely the place to stop if you want to relax and enjoy some top notch wine and food. I’ll see you there on the garden path! 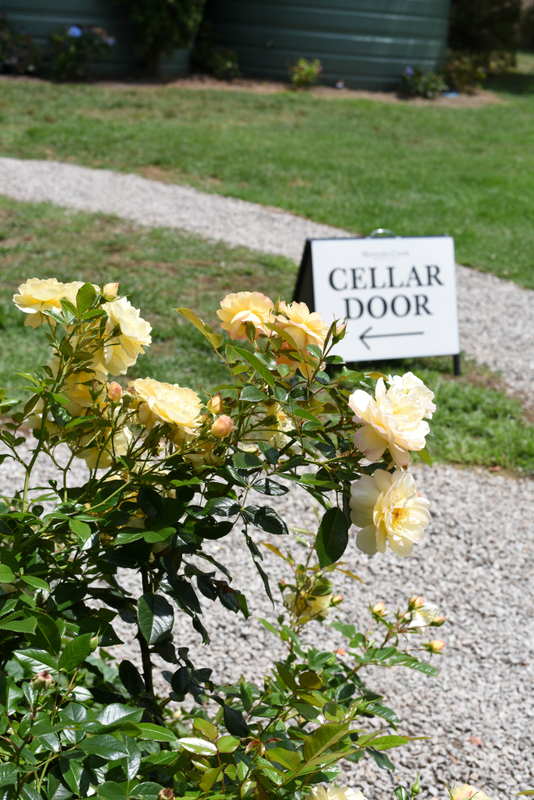 The cellar door is open on weekends 11am – 5pm. I was kindly invited as a guest of Merricks Creek Wines. All views are honest and my own.